How to Overcome Performance Appraisal Problems? Performance appraisal is a dreadful event both for the employee and the Manager. Though every company has some fixed guidelines and criteria based on which the appraisal takes place, but at the end of it, you will find the employees dissatisfied with their appraisals. They feel that their performance was not properly assessed. The appraisal was a biased one, where someone is being favored over the other. Every employee wants their performance to be evaluated fairly, but whether it is done or not is a case of serious debate. The main aim of performance appraisal is to motivate the employees by appreciating the hard work they have put in. It helps in maintaining an energetic work force who is completely engrossed in delivering good work. When the managers are starting the appraisal procedure, then there are several obstacles that they have to overcome. As human beings, we tend to favor someone and dislike someone, but as a manager, you can’t evaluate someone on the basis of your personal liking and disliking. Instead, you must look into the performance of the employees and rate them fairly. If they have done well all throughout the year, then they deserve to get a good performance rating, no matter how much you dislike him in person. Some companies rate the employees by comparing their performance with others. When this is done, then someone will end up being at the bottom, even when he has performed well as per company standards. Here the employee is not performing badly, but here the problem is with the goals that have been set. If he would have been judged as per company standards, then his performance would have been rated highly. This mainly happens in the sales. This one person is rude with his co-workers and doesn’t respect anybody, but he is a star salesperson. Thus, everybody in the leadership loves him. Now that he is pulling in so much of sales for the company, therefore, he is being rated high, irrespective of other drawbacks that he has. All throughout the year the employee has performed really well, but at the end of the year a silly but dreadful mistake happened and all his good work was wasted. He will now be appraised based on this mistake. On the other hand, this employee was a bad performer all throughout the year, but towards the end he performed exceptionally well in one project, so all his bad performance is forgotten and he ends up getting good ratings. He is a Rock star performer in all aspects, but he is not good with filing. So, the company has to hire a temporary worker to help him with the filing because of the numbers of files that have piled up. Due to this one drawback, he is being rated poorly. When the manager wants to go through the appraisal procedure real quick, then you will find that on an average everybody has got almost the same rating. This way, everybody is happy and he won’t have to answer any question at all. There are different kinds of appraisal problems, but as a manager, you will have to overcome all of them for the well being of the company. When you help your employees understand the direction and the goals of the companies and how they can align their own goals and growth with it, then you will ensure their long term commitment towards your company. In most cases when an employee received poor rating, then it is obvious that he will be a bit agitated. However, if you keep on giving him feedback on his performance from time to time, then he will be aware of his performance as per company standards. If someone is lagging in performance, then don’t wait till the end of the year to tell him or her where they are lagging, instead inform them right away, so that they have the time to overcome it. This way you will be able to avoid the confrontation to a great extent. If you perform well, then your salary will be increased accordingly. 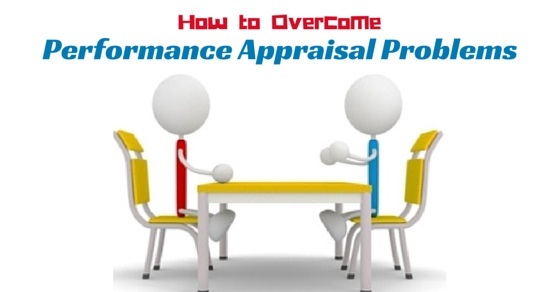 It is a fact that we all are aware of, but the appraisal discussion is not all about salary, instead it is about how the employee has performed and how much he has developed since the last time. Therefore, no matter how much the employee shows interest in discussing his or her salary, you must keep it aside and focus on the performance instead. This is one of the most important things in the appraisal procedure. The performance rating must directly relate to the job of the employee, nothing else matters. It must be strictly about his daily performance and how it affected the business goals in a positive or negative manner. If you do not put in a learning plan or a development plan, in front of the employee, then how will you assess the performance? In order to achieve a result or enhance performance, a proper plan is very important. You must include development of skills in your plan along with the long term action and short term action plan with specific objectives and goals. Note down the performance of the employee all throughout the year. This way you will be able to discuss the shortcomings and the achievement of the employee during the appraisal discussion. If you are not keeping a note of that and when an employee asks you the basis on which the rating has been provided, you will be in a big soup. Therefore, track the performance on a daily basis. Make sure that you do the performance appraisal in the correct manner, so that it yields the right fruit for your company. Previous articleHow to Have Difficult Conversations with Boss?